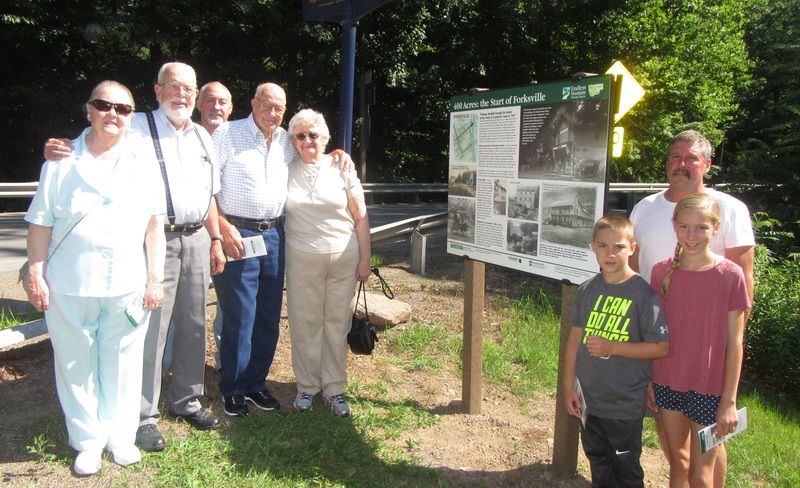 Direct descendants of Forksville’s founding fathers who were in attendance for the dedication of a new interpretive historical panel in Sullivan County on Thursday included (above, from left) Annabelle and James Rogers; Clair, Bill and Evelda Black; and Jonas, Stephen and Ivy Jones. 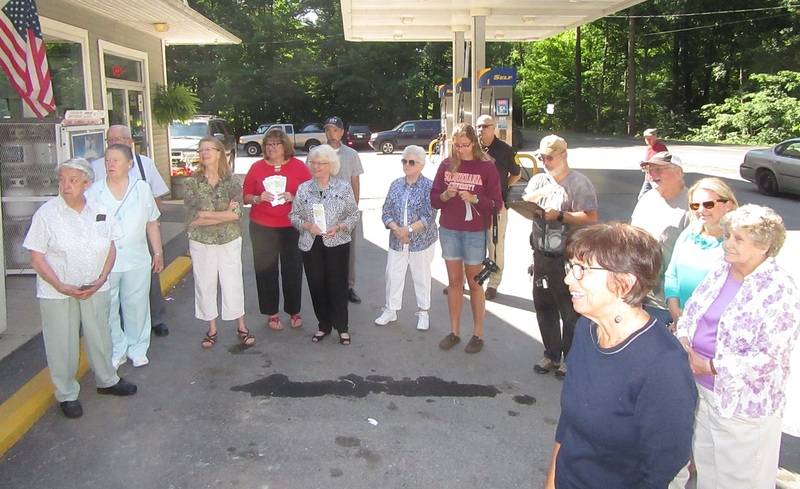 Residents with deep roots in the Forksville area met representatives of the Endless Mountains Heritage Region (EMHR) and a handful of elected officials at the intersection of routes 87 and 154 on Thursday morning. They were there to celebrate the installation of an interpretive panel depicting the early history of the Sullivan County borough situated at the confluence of the two branches of the Loyalsock Creek. 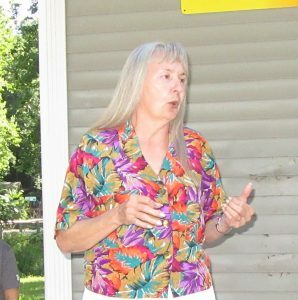 Among those in attendance were direct descendants of the Huckell, Rogers and Bird families, who founded the village in the early 1800s and built its first businesses, its famous covered bridge, and the first schoolhouse in Sullivan County. Clair Black of Cherry Township attended with his parents, Bill and Evelda Black, all descendants of James and Mary Rogers Black. Mary’s brother, Sadler Rogers, is credited with the construction of the covered bridge in 1850. Forksville was incorporated as a borough in 1880. Stephen Jones lived in the Forksville area until his family moved to North Carolina. He returns to the area each summer with his children, Jonas and Ivy, who have taken a keen interest in the town’s history and their ancestry. Their lineage includes the Huckells, Rogers, Birds and other early settlers including the Granges and the Molyneux. Huckell brought his family to the forks of the Loyalsock in 1797. Sarah Huckell donated a half acre of the family’s 400-acre holdings in 1816 for the construction of the first school. The new sign is situated along Route 87 near the convenience store owned by Randy and Peg Bagley. Much of the research for the panel and an accompanying brochure was conducted by EMHR board president Melanie Norton, who is also the director of the Sullivan County Historical Society. Brochures are available inside the convenience store, at the Historical Society’s museum located behind the Sullivan County Courthouse in Laporte, and at the Endless Mountains Visitors Bureau near Tunkhannock. “This sign perpetuates the history of Forksville for future generations to know how it came about,” Norton (above) told those in attendance on July 12. The project was several years in the making and was funded by Chief Oil & Gas Company, PA DCNR and the EMHR. A similar sign depicting the history of nearby Jamison City will be installed and dedicated later this year. The sign was installed by employees of the Sullivan County Rural Electric Cooperative, which also had representatives on hand for the event.